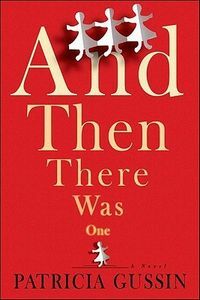 And Then There Was One by Patricia Gussin: Synopsis and Online Purchase Options. Synopsis (from the publisher): One is the loneliest number. Nine years ago, Katie and Scott Monroe were blessed beyond their wildest dreams with identical triplets, Sammie, Alex, and Jackie. Three beautiful daughters and two adoring parents formed the picture-perfect party of five. But this tight-knit family unravels when the three little girls go to see a movie, but only one emerges from the darkness of the theatre. How could Sammie and Alex vanish without a trace? Plunged into the abyss of a parent's worst fear, Katie and Scott hang by a thread-waiting, worrying, not knowing, and confronting the terrifying realization that the kidnapping may not have been a random act. Who took Sammie and Alex? Why? Where are they? When will they be found? And what if they're never found, or not found alive? When Jackie, the remaining triplet, crumbles under the weight of grief and survivor's guilt, Katie and Scott struggle to hold out hope and hold on to what remains of their family. Until — or unless — Sammie and Alex are found safe, this picture-perfect family can't be put back together again.